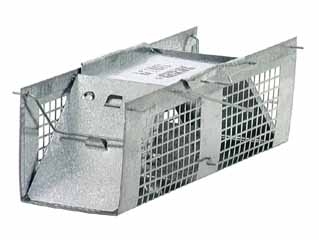 This plunger style mole trap is best for use if you reside in an area with soft, rich soil. 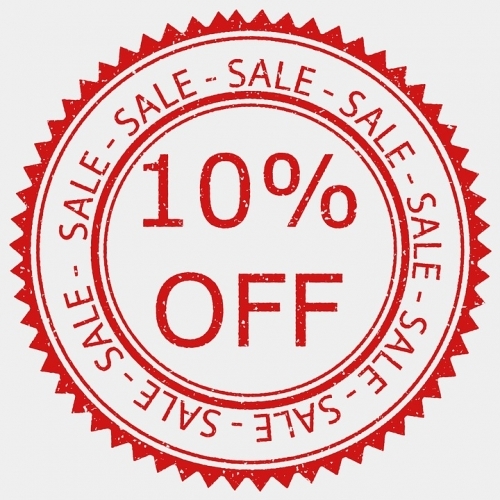 Enables consumers to catch and release mice. 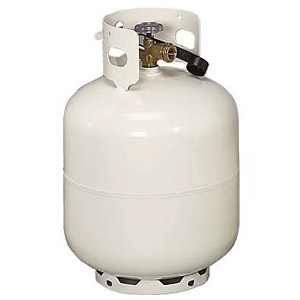 Can be used around food, water, children and pets. Disposable or reusable - depending on consumer preference. Easy to set and bait. Ideal for consumers who do not want to see or touch the mouse. Ideal for Squirrels and similar sized animals. Constructed of sturdy wire mesh, rust and corrosion resistant. Fully assembled and ready to use. Raccoon Trap- One spring loaded door, 32x10x12. 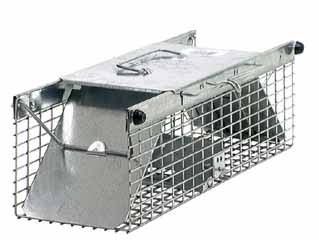 Large squirrel/rabbit trap with one spring loaded door, 24 in. X 7 in. X 7 in. One spring loaded door. 42 in. X 15 in. X 15 in. professional trap. Two spring-loaded action doors, 42 in. X 10 in. X 13 in., preassembled. Two spring-loaded doors, 36x10x12, preassembled. Two-spring loaded doors, 30 in. X 7 in. X 7 in., preassembled. Ideal for Rabbits and similar sized animals. Constructed of sturdy wire mesh, rust and corrosion resistant. Fully assembled and ready for use. 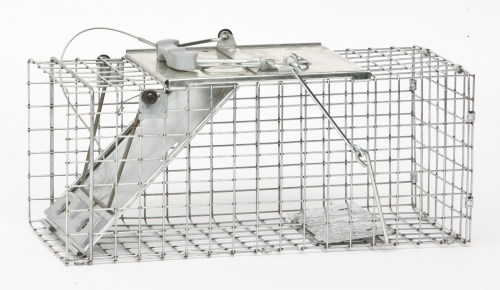 Trap opens at both ends to give target animals extra confidence to enter the trap. Target animals, rats, weasels, chipmunks, and flying squirrels. Two spring loaded doors 18x5x5. Ideal for Mice and similar sized animals. 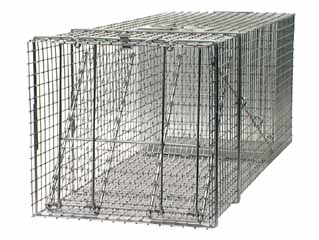 Constructed of sturdy wire mesh, rust and corrosion resistant. Fully assembled and ready for use. 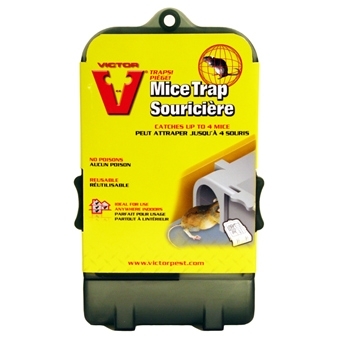 Trap opens at both ends to give target animals extra confidence to enter the trap. Unique trap setting features allows trap to be set with both doors or just one. Two spring loaded doors allow animals to enter from either direction. 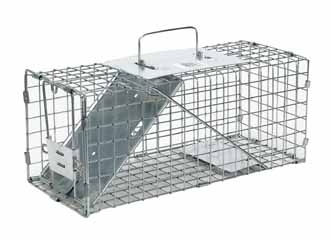 Squirrel sized easy set/release cage trap with one spring loaded door. 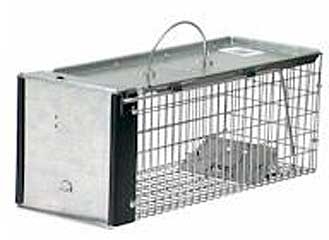 Set and release mechanism, located on top of the trap, limits interaction with animal. Trap can be set and released with one hand. 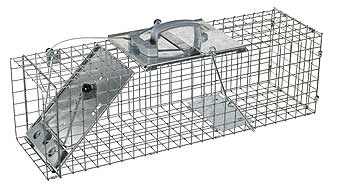 High-tensile wire mesh makes trap more durable without making it heavier. 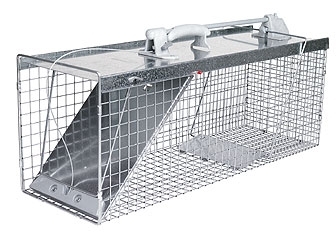 Ideal cage trap for catching rabbits, squirrels, skunks and similar-sized animals. Set and release mechanism, located on top of trap, limits interaction with animal. Trap can be set with one hand. 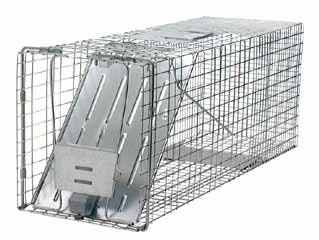 Animal safe design: rolled metal edges and snug fitting doors eliminates sharp surfaces and gaps that could harm the animal. Single gravity action door trap that is easy to bait, set, and release. 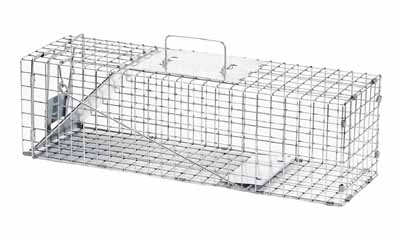 Unique high tensil wire mesh, steel reinforced for long life and maximum resistance to animal damage. Smoothed inside edges for the protection for the animal. Gravity action door with sensitive trigger ensures quick, secure catch. 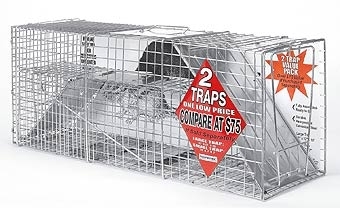 Catch and Release 2 Trap Value Pack Live Animal Trap set. 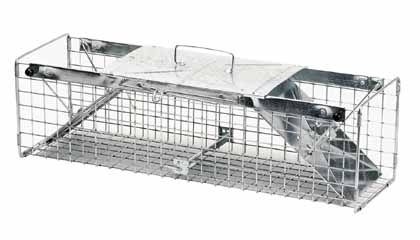 Includes the two most popular sizes of live animal traps, Large 32 x 12 x 10 and small 24 x 7 x 7. Heavy duty galvanized steel construction. Fully assembled. Great for racoons, possums, ground hogs, squirrels, chipmunks, rabbits, feral cats, wild dogs, foxes, rats and other rodents.